Definition at line 30 of file WikiFilePage.php. Definition at line 40 of file WikiFilePage.php. Definition at line 171 of file WikiFilePage.php. References DeferredUpdates\addUpdate(), as, loadFile(), and wfDebug(). Definition at line 92 of file WikiFilePage.php. References loadFile(), Title\makeTitle(), and NS_FILE. Definition at line 136 of file WikiFilePage.php. References $file, $mDupes, $self, as, loadFile(), and RepoGroup\singleton(). Definition at line 128 of file WikiFilePage.php. Referenced by getSourceURL(), and getWikiDisplayName(). For local files, this is the same as getCategories(). 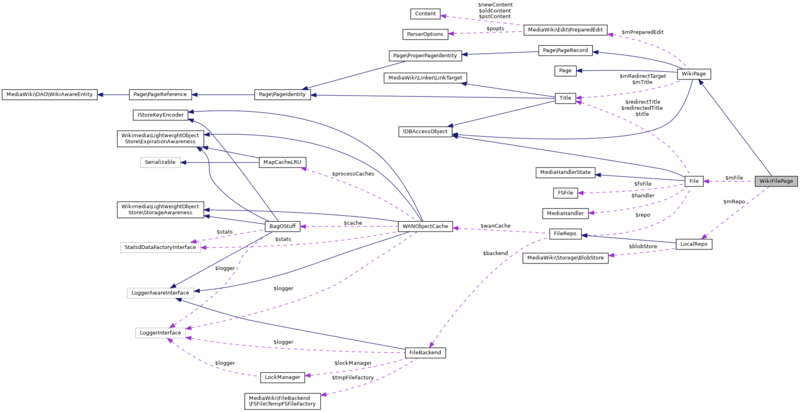 For foreign API files (InstantCommons), this is not supported currently. Results will include hidden categories. Definition at line 212 of file WikiFilePage.php. References $dbr, $file, $mFile, WikiPage\$mTitle, $res, $title, loadFile(), TitleArray\newFromResult(), NS_CATEGORY, and wfDebug(). Definition at line 74 of file WikiFilePage.php. 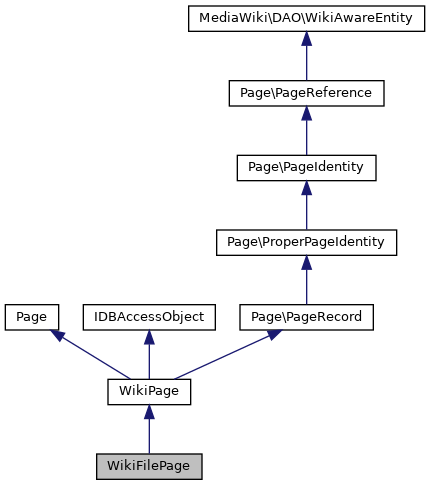 References WikiPage\$mRedirectTarget, loadFile(), Title\makeTitle(), NS_FILE, and null. Definition at line 256 of file WikiFilePage.php. Definition at line 248 of file WikiFilePage.php. Definition at line 120 of file WikiFilePage.php. Definition at line 108 of file WikiFilePage.php. Definition at line 57 of file WikiFilePage.php. Referenced by doPurge(), followRedirect(), getDuplicates(), getFile(), getForeignCategories(), getRedirectTarget(), isLocal(), and isRedirect(). Definition at line 49 of file WikiFilePage.php. Definition at line 38 of file WikiFilePage.php. Definition at line 32 of file WikiFilePage.php. Referenced by getFile(), and getForeignCategories(). Definition at line 36 of file WikiFilePage.php. Definition at line 34 of file WikiFilePage.php.